Heading into Pacific Rim: Uprising, I struggled to recall much of Pacific Rim. That didn’t really matter. Like its protagonist Jaegers, Uprising cranks along like a fairly well-oiled if uninspired machine, only filling in knowledge gaps when absolutely necessary (and often via bouts of exposition). It is swamped with techno-scientific jargon, the majority of which barely enters the cinema-sphere before shooting way over the heads of viewers. But none of it really matters. All that matters is the presence of good giant robots, the counter-presence of bad giant robots, and the absolute certainty that they’re going to fight. And that, I guess, sums up Steven S. DeKnight’s sequel in a nutshell: Uninterested in character development — a few half-hearted attempts aside — and thoroughly compelled by carnage. And provided you leave your brain at the door upon entering, it’s actually sort of okay. This is primarily because it has John Boyega front and centre. The Star Wars sophomore has bags of charisma and a playful wit that helps him overcome the often cliched dialogue. At one point he is charged with giving a rallying speech before a group of junior Jaeger users, a speech we’ve seen a million times before and in situations where the drama has been significantly better earned, yet he delivers it with enough panache to get you at least a little fired up. Boyega plays Jake Pentecost, son of Idris Elba’s now deceased war hero, who has swapped his father’s honour (or something) for a freeing scavenger lifestyle spent on the decimated coast of LA (or somewhere). 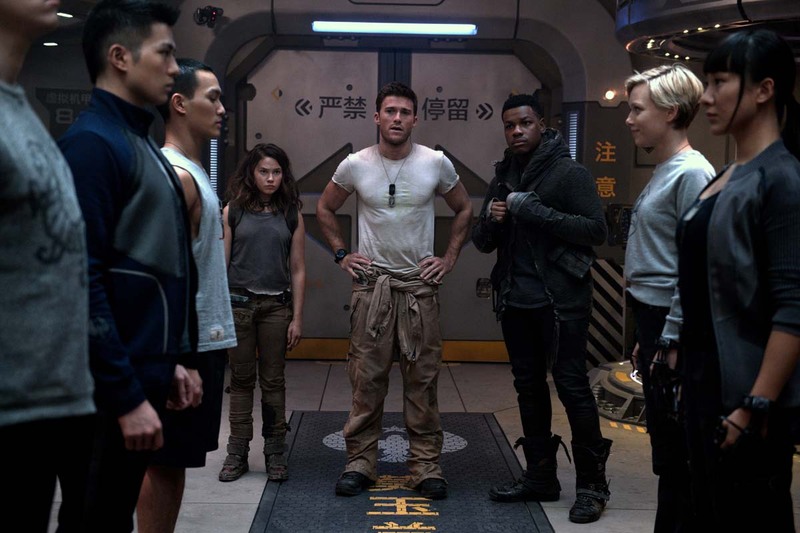 Upon being captured by the Pan-Pacific Defence Corps, he suddenly rediscovers his honourable streak, rejoining the ranks of civilisation protection alongside his old Jaeger partner Nate (Scott Eastwood), who sort of holds a grudge but not really. Good thing too, because soon after Jake adopts the heroic tag, the world comes under threat from a Jaeger drone system gone wrong and a bunch of giant Kaiju creatures. That story summary sounded quite snarky, but to its credit the film wears a snarky, self-reflective attitude. There’s a great moment where you think eccentric PPDC scientist Dr. Hermann Gottlieb, played (obviously) by Burn Gorman, is about to unleash Elba’s signature “Cancel the Apocalypse” cry from the previous film, but instead the screenwriters lump him with a significantly flimsier and entirely forgettable punchline. Gorman, like many others, finds himself embodying a walking stereotype and, like many others, makes the best of it. Cailee Spaeny, for instance, plays the newbie cadet whose rebellious existence has landed her in Jaeger school. Spaeny projects a charming aura despite the well-worn character type, and she has solid comic chemistry with Boyega. Scott Eastwood, looking more and more like Captain America Chris Evans by the reel, has less room to manoeuvre, his only real character quirk coming via a weird non-love triangle between himself, Jake, and Adria Arjona’s otherwise sidelined Jules Reyes. Elsewhere, Charlie Day is charged with doing his Charlie Day shtick, while Rinko Kikuchi returns as Mako Mori, Jake’s adopted sister and PPDC executive. You probably shouldn’t feel short-changed by a giant monster flick that lacks standout characters, but a better film would have at least a few (see Jurassic Park or Alien). That being said, Uprising does fulfil its visual duties. The Jaegers have a commendably imposing aura, particularly prevalent in a scene that shows three of them gliding down from the sky to challenge a rogue robot. Cinematographer Dan Mindel frames the shot well, depicting the destructive menace of the aforementioned rouge before patiently bringing the trio into focus, their collective authority increasing by the frame. And the enemy creatures are quite creepy too: A swarm of bug-like Kaiju unleashed towards the end won’t please anyone averse to creepy crawlies, but it does make for a neat mid-battle game-changer. This is better than anything the Transformers franchise has offered, not only because it has one or two performers worth rooting for, but also because its battle sequences are easy to follow. Unlike Transformers’ Hieronymus Bosch-esque action sequences, Uprising clearly defines the good guys and bad guys, and takes care to depict the consequences of each robotic right hook or metallic missile strike, affording viewers a chance to digest events. This is in part because natural breaks in the action take us inside the heads of the giant mechanical beasts, showing us the humans in control and thus giving the Jaegers a degree of humanity. But it is also simply down to decent action direction: DeKnight acted as showrunner on the excellent first season of Marvel’s Daredevil, and while the fights here lack the bone-crunching inventiveness of those interspersed throughout said series, they do at least adhere to Daredevil’s visual clarity. It may be an easy conclusion to arrive at, but it’s also the right one: If warring monsters is your type of thing, Uprising should tick enough boxes to offer an enjoyable experience. It will also do the job if you just want to spend a few hours at the cinema without having to rev any brainpower. Like me, you might even chuckle a few times — kudos Boyega. What’s certain is you will have the chance to see plenty of other, better blockbusters in the coming months (Ready Player One is already out). Hey, by the end of the summer there is every chance you’ll have forgotten you even went to see Pacific Rim: Uprising on a cold night at the end of March. But at least it knows its place. It’s fine, and that’s fine.